If you’re in the mood for some creepy slots fun then take a look at the new Crypt Keeper slot from Pariplay. 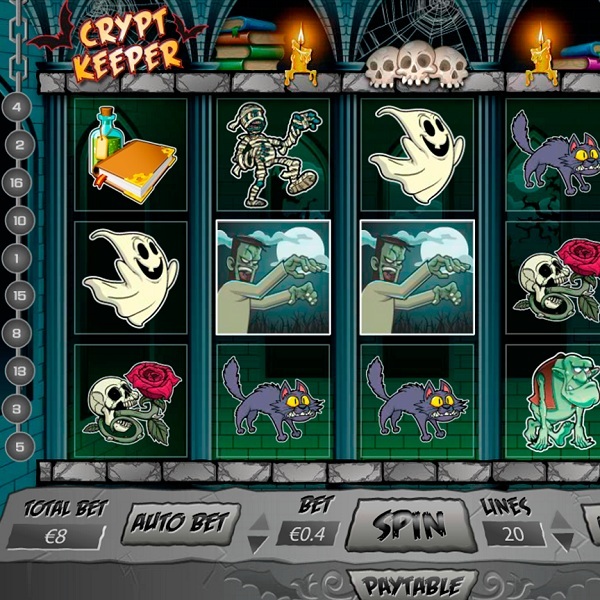 Crypt Keeper is a 5 reel slot with up to 20 paylines. The reels are set against a backdrop of books, candles and cobwebs. There are nine symbols on the reels and they are: a Mummy, a skeleton, a troll, a pumpkin in a witch’s hat, a book of spells, a skull and rose, a cheerful ghost, a black cat and a bat. Frankenstein’s monster is the wild and there are Werewolf and Dracula bonus symbols. If you can land three Werewolf bonus symbols on the reels you will be taken to a screen with a number of doors. You need to pick them to reveal multiplier values until you find the ghost. You then win the total multiplier applied to your stake.